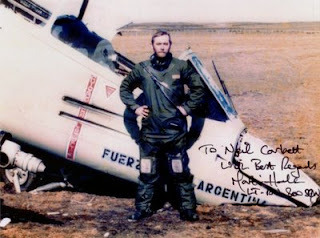 Martin Hale with Pucara wreckage. Dagger A of FAA Grupo 6 was shot down over Pebble Island by Lt Martin Hale RN in No.800 Sqn Sea Harrier using Sidewinder. Lt Volponi killed.